Heat City was hoping to get its hands on a nice, colorful police report about the attack on a Phoenix television news crew earlier this week. But we found out Friday it’s not going to happen. 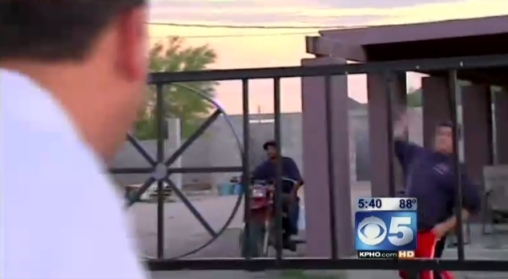 It turns out the KPHO (Channel 5) crew never pressed charges against the man who threw some large rocks at them Wednesday while they were on assignment in Casa Grande. File it under the dangers of being a journalist. In this must-watch video, Phoenix television news reporter Pat McReynolds and a videographer dodge rocks being thrown at them by a man they were hoping to interview. Challenger Bill Montgomery pulled out a major upset in the Republican race for Maricopa County attorney on Tuesday by unseating one of the most familiar names in Arizona politics, Rick Romley. Romley conceded the race within hours of the polls closing after unofficial results showed him down by almost 12 percent. Montgomery was leading 50 percent to 38 percent. “In a way, it feels very satisfying to have hard work pay off like this,” Montgomery said in an interview afterward. Onetime presidential nominee Sen. John McCain weighed in on the fierce political feud in Maricopa County on Thursday by endorsing Rick Romley in the Republican primary for county prosecutor. In an email to Romley’s supporters, the Arizona senator praised the interim county attorney as a prosecutor who has the wherewithal to help sort out a nearly two-year political feud that has plagued the local government here. Starting this week, my work will be appearing regularly on the political news site, the Arizona Guardian. The specifics are still being worked out, but the broad outline was hatched over the long Fourth of July weekend. I’ll be covering a number of political races as well as helping the Guardian grow as a company. This is a great opportunity to work with a fledgling company that has a bright future. Yes, the Guardian is a paid-subscription site, which means you’ll have to pony up some cash to read it. 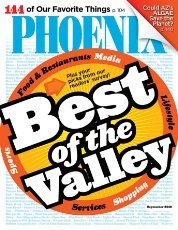 You may remember I wrote a fairly in-depth profile about the company last year in Phoenix magazine. At the time, I said it was too expensive for most people, but the company’s target readers — lobbyists, lawyers and politicians — were often willing to pay the price because it gives them the kind of news they need for success. That model has worked for the Guardian so far. Now, the founders are hoping to build on that accomplishment. They are open to new ideas and experiments, and that’s where I’ll be playing a role. What does that mean specifically? I’ll let you know once we figure it out. Heat City will still be here. This site will remain a place for me to write stories that don’t have a home anywhere else. The only difference now is that my political (and sometimes legal) stories will be appearing in the Arizona Guardian. As a special offer for readers of Heat City, the Guardian is also offering a 60 percent discount to new subscribers. This means individual readers can get access for just $12 a month (down from $30) and businesses, such as law firms, news organizations and creative agencies, can give all their employees access for just $60 a month (down from $150). When you sign up, simply enter the coupon code heatcity for your discount. Finally, if you’ve been one of the generous people who has financially supported Heat City over the past year and a half, we are planning something special for you. Look for it in your email box over the next week.